So over the weekend we took part in the 2014 Global Game Jam at Bristol’s Games Hub. First of all we’d like to say a big thank you to the Hub for hosting us and the event! It took roughly an hour and a half to lock down a concept we were all happy with that linked with the theme. We looked at the potential diversifiers on the jam site to provide more challenge, and settled on: a local multi-player game; a player or players has three lives; and characters that don’t suggest a gender. We also set our own which I will explain later. It’s for two-four players with procedurally generated maps, where one person is a vampire stalking a village for fresh blood, and the rest are hunters trying to flush them out. As a hunter your job is to protect the village by tracking and wounding the vampire with torchlight. You each hold a torch and can drop up to three other torches in the area. Communication and coordination are key, because every torch fizzles out over time, and if your personal torch dies you’re surrounded by a red glow which tells the vampire they can freely convert you without getting damaged. If you don’t want to be turned you’ll need to run back to the bonfire for more torches or share another hunter’s light. If you’re the vampire your need to feed means clearing each of the homes in the village. Doing so sustains you for longer. You can also feed on the villagers that roam the map for a smaller amount of blood, but be careful! You are disguised as a villager so feeding on them removes potential cover. Remember: until you’re found they see you as one of them, not as you truly are. Use that to your advantage. We were happy to meet the gender-ambiguous character goal, as well as making it a local multi-player game with three lives (for the vampire(s) at least). 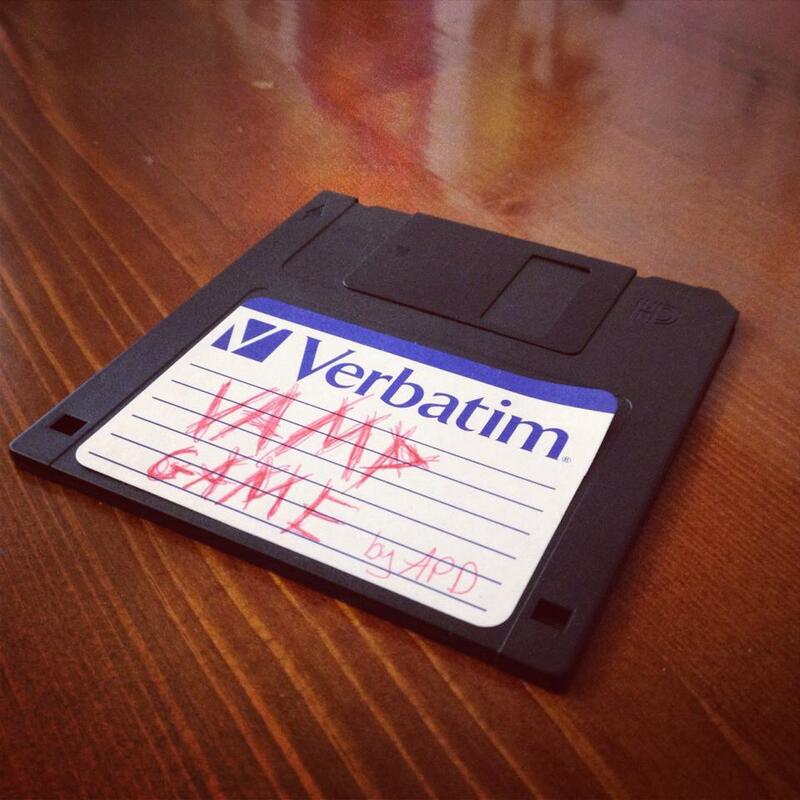 Our own goal mentioned earlier was to make something that would fit onto a floppy disc. It was interesting to get it down to under 1.44MB, and we succeeded! Things we learned: you can still buy floppy discs fairly easily. If you would like to try the game for yourself you can*. Just follow this link to our GGJ14 page and let us know what you think! *requires two-four Xbox 360 controllers and uses just the D-pad and A button (or equivalent). It was great to see the variety of games on display, and we hope to be there for the next one!